I’m pleased to announce the release of Love’s Target, my 7th story in the Montana Sky world created by Debra Holland. When a casino owner demands her hand in marriage to cancel her father’s outstanding debt, Vanora Deverell and her father go on the run. No matter what Vanora does, she’ll never do it as well as her late brother, even though she’s stepped in as her father’s apprentice. Having to dress as a boy to enter shooting contest grates on her nerves, but her shooting skill is their best chance to get out of debt. Rancher Trent Melbyrne strives for recognition as a horse breeder in his own right. In a Bozeman shooting contest, he’s chagrined when his accomplishments are bested by a boy…until he learns a secret about his opponent. By revealing the shooter’s secret, he sets off a string of events that lead to a showdown on his ranch in Morgan’s Crossing, Montana Territory. Can he atone for the danger he’s caused? Also new to the Montana Sky world are stories by three other authors. 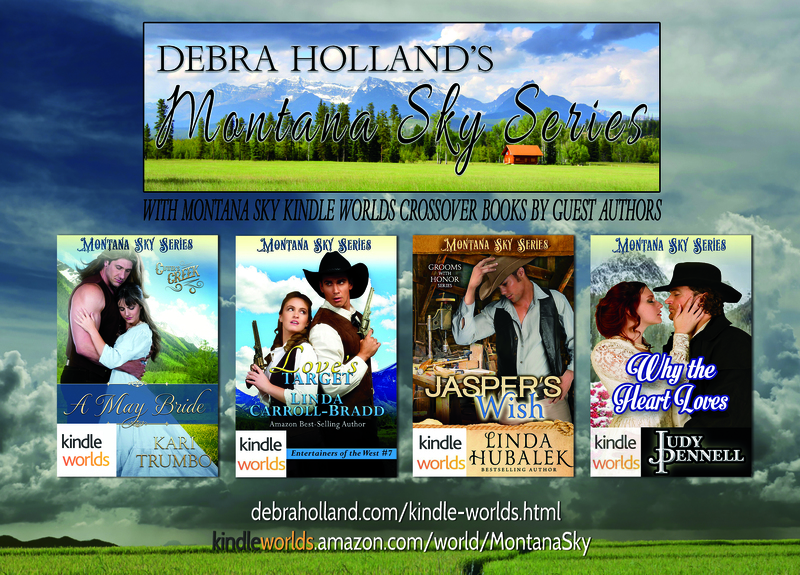 If you read historical romance and want a couple of great bargains, try my Montana Sky Kindle Worlds stories that are on sale during June for only 99cents each. 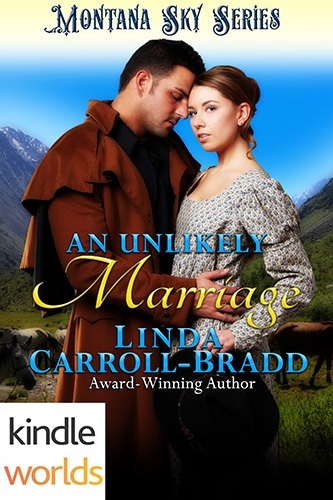 Laced By Love is one of the original 14 launch novels that expanded the little mining town of Morgan’s Crossing established by Debra Holland in two of her books, Mail-Order Brides of the West: Prudence and Mail-Order Brides of the West: Bertha. An Unlikely Marriage follows the second York sister’s relationship in a marriage of convenience story. Helping injured cowboy Torin Quaid drive mustangs north seems like a good way for vaudevillian Nola York to earn a train ticket east—and get one step closer to her goal of auditioning for Buffalo Bill’s Wild West stage production. Easy-going Torin liked the pretty brunette the first night he saw her performing on stage, and he admires her determination to complete the drive. The temporary marriage is solely for propriety’s sake to avoid scandal on the week-long overland ride to Meadowlark. Until disaster strikes, and the two must rely on each other—emotionally and physically—to safely reach Torin’s ranch. Will a marriage of convenience turn into more on a trail drive through Montana Territory? YAY! 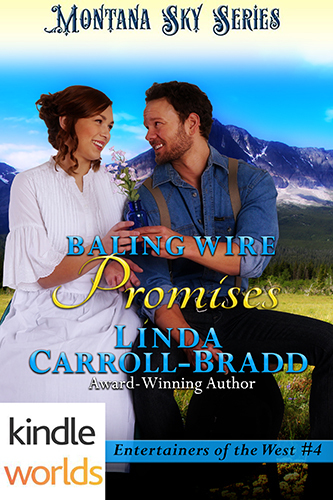 Today is release day for BALING WIRE PROMISES, Entertainers of the West #4, a Montana Sky Kindle Worlds novella. In this story, I bring the third Andrusha brother, bounty hunter Pete Andrews, who is still living under his alias from when spies attempted to learn the family’s leather tanning secret, into contact again with his brothers in Morgan’s Crossing. On his ride from Idaho Territory, he encounters a woman and five children making their way south after an orphanage fire robs them of their home. Raised better than to desert a woman, Pete offers to help her reach the next town. Only by a fluke did Fantine Pomeroy and five children survive an orphanage fire. Now she needs to travel hundreds of miles to deliver them to Virginia City. Fantine’s upbeat manner is tested by the exhausting toil of driving all day, foraging for food and dealing with traumatizing nightmares. But a promise must be honored. One night a stranger invades their campfire, and a tentative alliance is forged. I’m looking for readers willing to accept an ARC with the promise of posting a review by the end of this month. Those doing so will be entered into a drawing for either a print copy (US only) or a boxed set of A Year of Romance, Books 1-4 in “Dorado, Texas” series. Interested, email me at l.carrollbradd@gmail.com. Limited copies available.